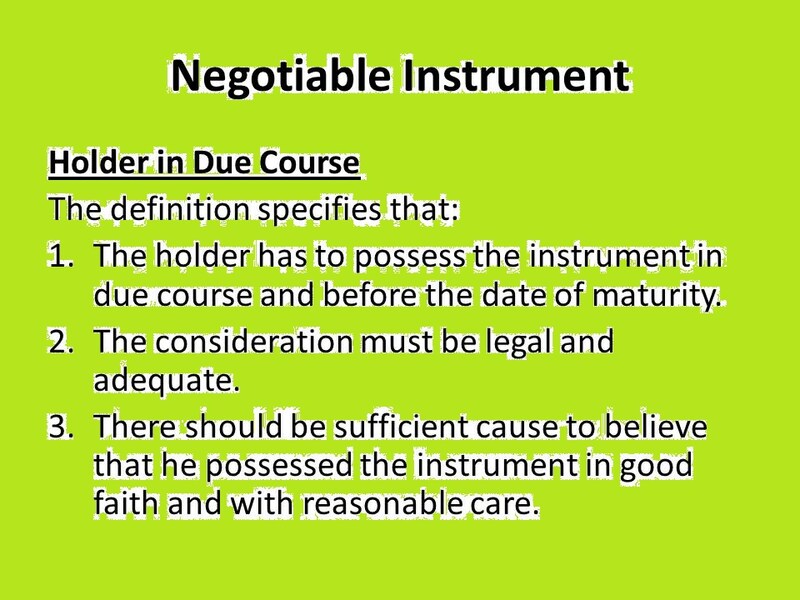 HOLDER IN DUE COURSE AND PAYMENT IN DUE COURSE: A negotiable instrument is transferable from person to person. The Negotiable Instrument Act confers upon the person, who acquired it bona fide and for value, the right to possess good title to the instrument. Such person is called “holder in due course”. Each and every person in possession of a cheque or bill cannot be its holder in due course and cannot claim the statutory protection granted under the Act. If an instrument falls into wrong hands the holder thereto cannot enjoy the privileges of a holder in due course. According to section 8 the “holder of a promissory note, bill of exchange or cheque means any person entitled in his own name to the possession thereto and to receive or recover the amount due thereon from the parties thereto”. He must be entitled to the possession of the instrument in his own name and under a legal title. Actual possession of the instrument is not essential: the holder must have the legal right to possess the instrument in his own name. It means that the title to the instrument is acquired lawfully and in a proper manner. For example if a person acquires a cheque or bill by theft, fraud, or forged endorsement or finds it lying somewhere, he does not acquire in his own name legal title thereto and hence he cannot be called its holder. He must be entitled to receive or recover the amount from the parties concerned in his own name. For this purpose it is essential that the name of the holder appears on the document as its payee or endorse, if it is an order instrument. In case of bearer instrument, the bearer may claim the money without having his name mentioned on the cheque. The holder is competent to receive payment or recover the amount by filing a suit in his own name against other parties, to negotiate the instrument and to give a valid discharge. In case a bill, note or cheque is lost or destroyed, its holder is the person so entitled at the time of such loss or destruction. In other words, the person who was entitled to receive payment at the time the instrument was lost, will continue to be regarded as its holder, the finder does not become its holder. The negotiable instrument must be in the possession of the holder in due course. In case of an order instrument, he must be its payee or endorse, i.e. his name must appear on the instrument. The negotiable instrument must be regular and complete in all respects. Alterations, if any must be confirmed by the drawee through his signature. Holder of an incomplete document cannot be its holder in due course. The instrument must have been properly delivered to the holder in due course. The case of an order cheque endorsement in favors of the holder is essential. A postdated cheque is not deemed to be irregular. The instrument must have been obtained for valuable consideration, i.e. by paying its full value. A person who receives a cheque as a gift will not be called its holder in due course for want of consideration. The consideration must be legal and adequate. For example, if a cheque is given in respect of a debt incurred in gambling, the consideration for the cheque is unlawful. If the value of the consideration falls short of the amount of the instrument, the person will be deemed as holder in due course to the extent of the value of consideration. The instrument must be obtained before the amount mentioned therein becomes payable. This condition is applicable to document payable otherwise than on demand and does not apply to a cheque which is always payable on demand. Holder in due course must obtain in instrument without having sufficient cause to believe that any defect existed in the title of the transferor. This is the most important condition to be satisfied. The title of a person to the negotiable instrument is deemed to be defective if he acquires it by unfair means, e.g., by fraud, coercion undue influence or by any other illegal method or for an illegal consideration. If he does not possess any title thereto, his title is also deemed to be defective. Section 9 lays heavy responsibilities on the person accepting a negotiable instrument in this regard. He should not only have no notice of any defect in the transferor’s title thereto. But he should have no cause to believe that the title was defective. It means that the circumstance of the case should give raise to any doubt or suspicion about the defective title of the transferor. The holder in due course should, therefore, exercise great care and take all necessary precautions in finding out if the transferor’s title was defective. If he shows negligence or does not take due care in this regard, he shall not be called the holder in due course. The existence of consideration is not essential in case of a holder, but a holder in due course obtains the instrument after paying its full value. For example, if a cheque is issued to provide a gift or donation to a charitable trust, the trust not becomes its holder in due course. On the other hand, tuition fee paid to a school or college is for valuable consideration. Hence the school or the college acquires the status of holder in due course. The person entitled to be called holder in due course must become the possessor of the instrument before it become payable. For example, if a bill of exchange is payable on 05/03/2018 a person who possesses it before this date is entitled to be its holder in due course. If it is obtained after this date the possessor will not be called its holder in due course. In case of a holder neither actual possession nor any time limit within which it must be acquired is required. Defect in the transferor’s title: The most important point of difference is that a holder in due course acquires an instrument without having sufficient cause to believe that any defect existed in the title of the transferor. This condition is not essential in case of a holder. This condition casts a heavy responsibility on a person who claims to be a holder in due course –he should not only not have knowledge of the defective title of the transferor but in the circumstances of each case, there should be no cause to believe that any defective exists in the title of the transferor. It means that the holder in due course must obtain an instrument after taking all possible care about the transferor’s good title. Example: (1) A debt in due from a partner of a firm to X. The partner endorses in favour of X a cheque drawn in favour of the firm. The circumstances of the give rise to doubt about the title of the partner to the cheque drawn in favour of the firm. If X satisfies himself about the partner’s valid title to the cheque he becomes its holder in due course. (2) A cheque for Tk 10,000’s issued by U.S. Embassy in favour of furniture supplier in Dhaka. It bears an endorsement in favour of X, who is government servant. The latter endorses it to Y for valuable consideration. The circumstances of this case are sufficient to cause a doubt in the mind of Y as to how the cheque could have come into the hands of Government servant from firm of furniture suppliers Y is entitled to become holder in due course only if he accepts the cheque after satisfying himself about the good title of his transferor. An endorsement in blank may be converted by him into an endorsement in full. He can negotiate a cheque to a third person, if such negotiation is not prohibited by the direction given in the cheque. He can claim payment of the instrument and can sue in his own name on the instrument. A duplicate copy of a lost cheque may be obtained by a holder. He possesses better title free from defects. This is the greatest privilege of a holder in due course. He always possesses better little than that of his transferor or any of the previous parties and can give to the subsequent parties the good title that he possesses. Section 53 states that “a holder of a negotiable instrument who derives title from a holder in due course has the right thereon of that holder in due course “. The holder in due course is entitled to recover the amount of the instrument from any or all of the previous parties. The good title of the holder in due course is affected if he himself was party to the fraud or illegality which affected the instrument earlier. Liability of prior parties to a negotiable instrument, i.e., its maker or drawee, acceptor or endorser, is liable thereon to a holder in due course until the instrument is duly satisfied” It means that a holder in due course can recover the amount of the negotiable instrument from any or all of the previous parties to the instruments . Example: A drawee a bill of exchange on B payable to C. It is duly accepted by B. C endorses it to F, who is its holder in due course. Now F, the holder in due course, can realize the amount of the bill from B, its acceptor. If B fails to do so, F can recover the amount from A,C and E. All of them shall remain liable to F in respect of the bill till its payment is made. Right of the holder in due course in case of the inchoate instrument. If a negotiable instrument was originally an inchoate instrument and a subsequent transferor completed the instrument for a sum greater than what was the intention of the maker, the right of a holder in due course to recover the money of the instrument is not at all affected. Example: Sudhir purchased some goods from Ramesh. As the exact amount of money payable by him was not to known to Sudhir, he gave Ramesh a blank cheque duly signed by hi. Ramesh filled in the figure of Tk5000, whereas the amount the amount payable to him was tk 4250 Ramesh endorse the cheque to Kamlesh, who took it for valuable consideration and in good faith. Kamlesh, the holder in due course, is entitled to recover from the bank the amount of Tk5000, though Ramesh from whom he got it, was entitled to recover Tk4250 only. Right in case of fictitious bills, If a bill is drawn on behalf of a fictitious person and is payable to his order, the acceptor is not relieved of his liability to holder in due course because of such fictitious name. But it is essential that the holder in due course proves that the document bears the endorsement with signature in the same hand as that of the drawer and purporting to be made by the drawer. Example: X draws a bill on Y but signs in the fictitious name of Z. It is payable to the order of Z and is duly accepted by Y. X endorses it to A who become its holder in due course. Y the acceptor of the bill, cannot deny his liability on the bill to the holder in due course on the ground that it was drawn on behalf of a fictitious person Z. It is, however, essential that the signature of Z as drawer and as endorser, must be in the same handwriting. Right in case the instrument is obtained by unlawful means or for unlawful consideration. A person liable on a negotiable instrument cannot defend himself against a holder in due course on the ground that the instrument was lost or obtained from him by means of an offence or for an unlawful consideration. Example: A draws a bill of exchange on B in respect of an amount which the latter has lost in gambling. B accepts the bill. A endorses the bill to C who becomes its holder in due course. Now C has the right to recover the amount of the bill from B, who cannot plead that he was not liable on the bill as it was drawn for unlawful consideration. The same would be the position of B, if he is made to accept the bill under undue influence, coercion or fraud. In all such cases the right of the holder in due course remains unaffected. Estoppels against denying the original validity of the instrument. Section 120 provides that “no maker of a promissory note and no drawer of a bill of exchange or cheque and no acceptor of a bill of exchange for the honour of the drawer shall in a suit thereon by holder in due course, be permitted to deny the validity of the instrument as originally made or drawn”. Example: Ram is the maker of a promissory note for Tk 1000 payable to Ratan, who endorses it to Ravi for valuable consideration. On its due date, it is dishonored. Ravi files a suit for the recovery of the amount. Ram cannot deny that the instrument as drawn by him was not a valid one, i.e., he cannot dispute that no amount was due from him on the promissory note. Estoppels against denying the capacity of the payee to endorse. No maker of a promissory note and no acceptor of a bill of exchange payable to order shall, in a suit thereon by a holder in due course, be permitted to deny the payee’s capacity at the date of note or bill to endorse the same. Estoppels against denying signature or capacity of prior party. No endorser of a negotiable instrument shall, in a suit thereon by a subsequent holder, be permitted to deny the signature or capacity of any prior party to the instrument. Example: X draws a bill of exchange on Y in favour of Z who endorses the same to A, a minor. A endorses it to B and B to C, who becomes its holder in due course. It is dishonored on the due date. C, the holder in due course, has the right to file a suit against all or any of the parties to the bill except A, the minor. Now B the endorser cannot plead that A was a minor and had no capacity to endorse the bill and hence the bill is a void one. He will remain liable on the bill to C.
The payment of a negotiable instrument should be made to the right person by the paying banker or the acceptor of the bill; otherwise the latter shall be responsible for the same. The negotiable instrument Act provides protection to the paying banker or the drawee of a bill, provided the payment is made as required in the Act such payment is called payment in due course. Section 10 states “ payment in due course means payment in accordance with the apparent tenor of the instrument in good faith and without negligence to any person in possession thereof under circumstances which do not afford a reasonable ground for believing that he is not entitled to receive payment of the amount therein mentioned”. The payment should be made in accordance with the apparent tenor of the instrument. i.e., according to the true intention of the parties thereto as are apparent from the document itself. Payment may be made either in cash or through a clearing house or by a draft. If the banker makes payment of a postdated cheque before the date mentioned therein or pays a crossed cheque at the counter, he acts against the true intentions of the drawer and hence such payment will not be treated as payment in due course. The payment should be made in good faith and without negligence. The banker should make the payment in good faith, i.e., honesty and not fraudulently. For example, if a suspicion or doubt about the validity of the title of the payee or presenter of the cheque arises in the mind of the banker but he does not make proper enquires thereto, the payment is not deemed to made in good faith. The banker should not make payment negligently. He should take all necessary precautions and act as a reasonable person will act in the particular circumstances of a case. For example, he should ascertain that the cheque is complete, all alterations are duly confirmed and the endorsement thereon is regular. In case per pro endorsement, he should ascertain that the signatory is duly authorized to sign on behalf of the payee. If a cheque with forged signature of a drawer is paid, it will be deemed an act of gross negligence on the part of the banker and its payment will not be deemed payment in due course. Payment must be made to the person in possession of the instrument in circumstances which do not arouse suspicion about his title to possess the instrument and to receive payment thereof. For example, if the drawer of a cheque countermands its payment, the holder in due course will not be entitled to receive the payment. The payment of an order cheque should be made to the right person after proper identification. Sometimes the appearance and behavior of the person presenting the cheque at the counter may arouse suspicion in the mind of the banker about the validity of the former’s authority to receive payment. Example of payments which are not deemed payment in due course. A cheque dated 15th may 2017 is presented for payment on 5th may 2017 and is paid on the same day. A cheque bearing a special crossing in the name of Islami bank is paid when presented through the Bangladeshi bank. A cheque containing forged signature of the drawer is paid by the banker. A cheque having alterations in the name of the payee or the amount of the cheque, not confirmed by the full signature of the drawer, is paid by the banker. The drawer of a cheque countermands its payment, but the banker pays the cheque. An orderly or a peon of a company presents a cheque for a big amount on behalf of the company, which is contrary to the practice. The banker should enquire from the company before its payment is made. The negotiable instrument Act does not define the term ‘holder for valued In England, according to the Bill of exchange Act, where value of a bill has at any time been given, Its holder is deemed to be a holder for value regards the acceptor and all parties to the bill who become parties prior to such time. The person, who claims himself as the holder for value, need not himself give value. It may be given by prior party. Example: A bill is drawn payable to A, who transfers it to B for value, B transfers it to C without consideration, C is called holder for value. He can sue A on the bill if it is dishonored.